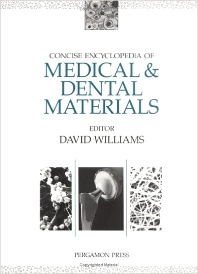 Containing over 60 articles specially written for this work or revised from the highly acclaimed Encyclopedia of Materials Science and Engineering, the Concise Encyclopedia of Medical & Dental Materials presents, in a single volume, the work of nearly 70 world experts on the current techniques and applications of materials which have been specially developed to satisfy the increasing needs of medical and dental science. Alphabetically arranged, articles cover the basic materials used including prostheses, implants, sutures and wound dressings. The biocompatibility, wear, corrosion and surface properties of the materials are also covered, as well as the mechanics of their implantation, adhesion and repair. Each article is extensively cross-referenced to other related topics and a bibliography is included referring readers to other appropriate current literature. Widely illustrated and complemented by a comprehensive three-level subject index, this is the most comprehensive and up-to-date survey of dental and medical materials available in a single volume. Selected Articles: Acoustic measurements of bone and bone-implant systems. Acrylic dental polymers. Acrylics for implantation. Adhesives in medicine. Aluminum oxide. Arteries, synthetic. Biocompatibility of dental materials. Biocompatibility: an overview. Biodegradation of medical polymers. Biomaterial-blood interactions. Carbons. Chemical adhesion in dental restoratives. Cobalt-based alloys. Collagen. Corrosion of dental materials. Dental amalgams. Dental implants. Dental materials: clinical evaluation. Dental plaster and stone. Dental porcelain. Denture base resins. Drugs: attachment to polymers. Endodontic materials. Elastomers for dental use. Fracture toughness. Glasses: agricultural and veterinary applications. Glasses: medical applications. Gold alloys for dental use. Heart-valve replacement materials. Hemodialysis membranes. Heparinized materials. Hydrogels. Invasive sensors. Iron-based alloys. Maxillofacial prostheses. Metals for medical electrodes. Ormosils: organically modified silicates. Polyesters and polyamides. Polymers for controlled drug delivery. Polysiloxanes. Polyurethanes. Porcelain-metal bonding in dentistry. Porous biomaterials. Silver in medical applications. Soluble polymers in drug delivery systems. Sterilization using ethylene oxide. Surface structure and properties. Suture materials. Tantalum and niobium. Titanium and titanium alloys. Wrought dental wires. Zirconia-toughened ceramics.